Each one of us was created to do more than simply serve God. The Father intended us to know Him—to have an intimate relationship with Him. However, God isn’t like a casual acquaintance on Facebook that we can just check in with every now and then. In order to have closeness with God, we must read His word, devote time to study, and talk to Him in prayer. Our heart desperately needs this intimate connection, but often life keeps us too busy and distracted with responsibilities to develop a devoted time of worship. Author Joanna Weaver confesses to being a fellow struggler when attempting to find a quiet time for study and reflection. She understands the challenges we all face. 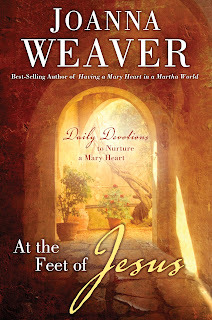 In her latest release, At the Feet of Jesus: Daily Devotions to Nurture a Mary Heart (WaterBrook Press / October 2, 2012 / hardcover / ISBN: 978-0307731005 / $ 15.99 / also available in e-book), Weaver gives readers the structure they need to grow closer to God. This 365-day devotional encourages and inspires women who want to deepen their spiritual lives as they spend a year at the feet of Jesus. 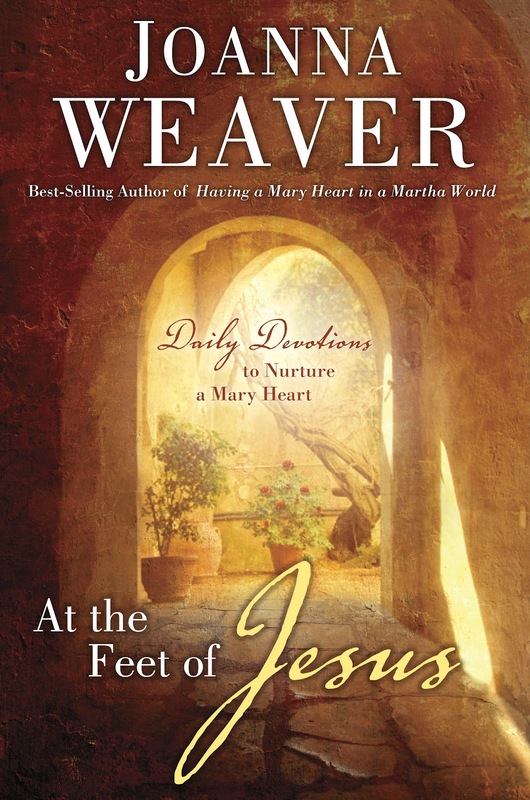 At the Feet of Jesus combines a conversational tone, real-life stories and insightful Bible teaching to engage readers at an emotional and spiritual level. Each page-per-day devotional includes a brief inspirational reading, a short Bible passage and a reflection question designed to create a greater hunger for intimacy with God. Based on material adapted from Weaver’s beloved Bethany trilogy (of Having a Mary Heart in a Martha World, Having a Mary Spirit and Lazarus Awakening), this inspirational resource offers perspective-shifting insights gleaned from Jesus’s interactions with his friends Mary, Martha and Lazarus. Additional features include “Outtakes,” which is all-new material not included in previous releases. Going Deeper sidebars provide readers tools to cultivate deeper study and more meaningful quiet times. In the back of the book, readers will ﬁnd a unique one-year Bible reading guide that alternates back and forth between the Old and New Testaments. Readers can also personalize this plan in a downloadable format at Weaver’s website, www.becominghis.com. The daily devotional format is perfect for Christmas gift-giving and starting the New Year on the right foot, but can be started along with the daily reading plan on any day of the year. With At the Feet of Jesus, readers will be spiritually refreshed and renewed as they daily move toward a richer, more abundant life. By accepting the invitation to set aside our duties, we can find the amazing peace and incredible joy that come from time alone with Him. Weaver equips readers to discover for themselves the riches that come from spending a portion of each day alone with God. At the feet of Jesus—that’s where true life begins! Click the banner to RSVP to the November 8 author chat! On November 8, Joanna Weaver will be hosting a live webcast event. Readers will be able to ask questions, share stories and win prizes. For more information, and to RSVP for the event, visit the Author’s Facebook page. Readers without a Facebook account can join the webcast via the Litfuse Publicity Group website. With more than one million books in print, Joanna Weaver is the best-selling author of Having a Mary Heart in a Martha World, Having a Mary Spirit, Lazarus Awakening, and the award-winning gift book With This Ring. Her books have been translated into several languages around the world. Weaver’s articles have appeared in such publications as Focus on the Family, Guideposts, and In Touch. She has also appeared on a number of national TV and radio broadcasts such as The Harvest Show, Midday Connection, HomeWord and others. She is also a highly sought-after speaker and shares her message at intimate gatherings and several high-profile events each year. As much as she loves writing and speaking, her greatest joy is found in being a pastor’s wife and a mother. The parents of three, Joanna and her pastor husband, John, live in Montana. 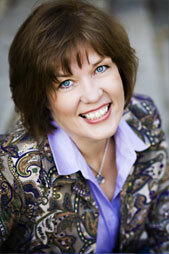 Learn more about Joanna Weaver and her books at www.JoannaWeaverBooks.com. Readers can also keep up with her via Facebook and Twitter. Well i agree with you one of things you have mentioned in this blog which are very truth. I suggest you should write little more about on this and i wish everyone should take advantage of reading this..